Considering downsizing for your next PC build? Then this is the competition for you. HEXUS, in partnership with Corsair, is giving three lucky readers the chance to win a Mini ITX upgrade bundle comprised of an Obsidian Series 250D chassis and an RM Series 650W power supply! There are three bundles waiting to be won, so don't miss out, answer the following simple question to enter our free prize draw. And don't forget, you can also claim a free second entry via Facebook! Hint: In case you missed it, you can find the correct answer at Corsair.com. The competition winner will be picked at random from all eligible entries that arrive by midnight of the closing date, April 10, 2014. The winners will be notified via email by April 17, 2014. The winner must claim their prize within 7 days of the promoter sending notification. If the prize is unclaimed after this time, HEXUS reserves the right to offer the unclaimed prize to a substitute winner selected in accordance with these rules. 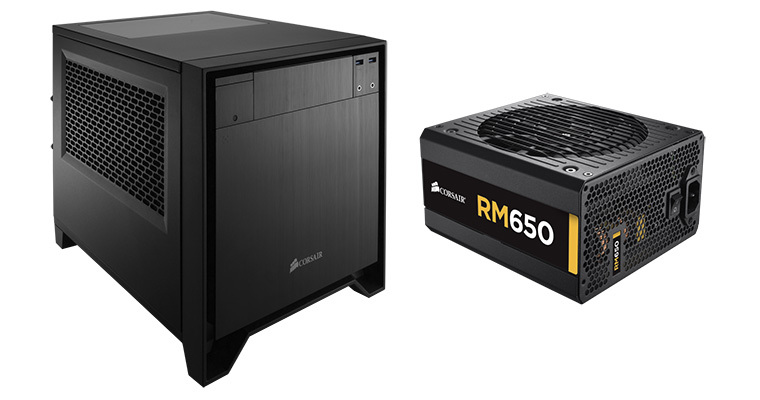 The prize bundle is one of three bundles comprised of an Obsidian Series 250D chassis and RM Series 650W power supply. Would love these for my ITX build! Oooooh that looks VERY nice!